What is the need for Micro Screws? With the rapid growth in technology has come the use of many electronic devices as standard in our daily lives. These devices are increasingly compact in design, becoming smaller, thinner and lighter as they evolve. As a result they require the fastenings that hold them together to be extremely small and lightweight. This means that tiny screws and micro fastenings are more and more in demand to service this growth in technology, and to meet the needs of the electronics industry where space is at a premium. So as electronic devices get smaller, so the need for smaller fastenings increases. Therefore this is a rapidly growing market with new products to meet these needs being developed all the time. 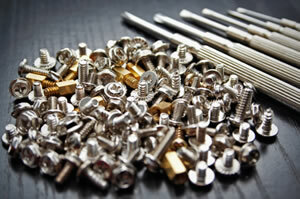 Micro screws have an ever growing diversity of uses. They are typically used in electronic devices such as smart phones, personal computers, laptops, tablets, MP3 players, printers and cameras amongst many more. They’re also used in medical equipment such as monitors and defibrillators, and they have even been used for orthodontic treatment, whereby self-tapping titanium screws are implanted and used as anchorage. Other important uses include eye glasses and watches. How are they used and handled? Obviously being so small raises some issues as to how these screws are handled and used. Some are as small as 1mm in diameter and 2mm in length, so they are not just downsized versions of larger screws, as this would create difficulties with tight tolerances and torque control. To deal with this, new design features have had to be created. In terms of installing these extremely small screws, accuracy levels must be very high due to how small they are to handle and creating enough tolerance, so special feeding and insertion devices have been manufactured to manage this challenge. One such example is the micro screw driving spindle which has a vacuum and other design features to ensure accurate installation on a repetitive basis. Micro screws and fastenings are evolving quickly, with new types of micro fastenings being introduced all the time to keep up with developments in technology and respond to new requirements and challenges. One such example is the self clinching micro fastening. With all development in fastenings will also come new ways to handle and install micro screws in this ever growing market. Alana Holder discusses micro screws and fastenings. For more information and to view the options for micro screws visit our website.